Bankruptcy and Business Reorganization Group partner Margie Reed died on December 30, 2013, following a several-year struggle against a particularly aggressive form of thyroid cancer. Margie's entire career as a lawyer was at Duane Morris. She was a Summer Associate at the Firm while in law school and started as a first-year associate with the Firm in 1982. She became a partner in the Firm in 1990 and served for many years as a member of the Partners Board. She practiced her entire career in the Firm's Bankruptcy and Business Reorganization Group, working alongside the late Dave Sykes, as well as with former Duane Morris partners like Judge Midge Rendell and Judge Jim Peck, with partner Skip Di Massa and many other current members of that practice group. 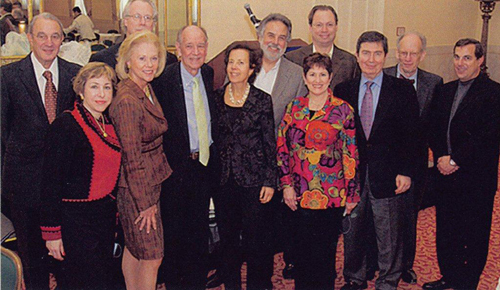 Margie Reed (center) with Fellows of the American College of Bankruptcy from Philadelphia, including alums Claudia Springer, Judge Midge Rendell, Dave Sykes and Judge Jim Peck. Said Chairman and CEO John Soroko, "Margie was upbeat and matter-of-fact about her illness, which was so very characteristic of her as both a person and a lawyer." Even while at home, she continued to work on client and Firm-related matters into and through November 2013, until she started a period of hospice in late December. Margie was 59. Said John: "Her contributions to the Firm's bankruptcy and business reorganization practice, through her work for leading clients and her mentoring of younger lawyers, were enormous. Margie was a true partner in every way. She was not only a very skilled and creative lawyer but, in all things, both big and small, she would always put her clients, her colleagues and the Firm first. She was a real role model." Margie Reed (center) and Reed's husband Duffy, with Duane Morris alumna (far right) Judge Karen Overstreet with (from left) Karen's sons Will and John, and husband John. Margie is survived by her husband Duffy and their daughter Rachel.